This may seem like such a straight forward part of make-up to apply, but truth be told there are many people out there incorrectly applying blusher. 1. 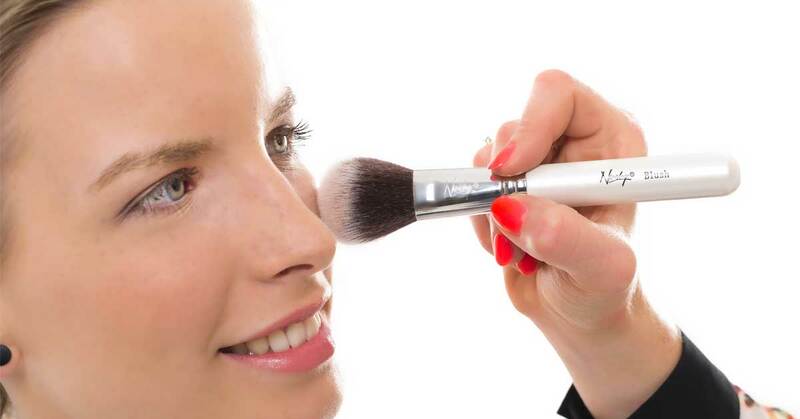 Before applying blusher you need to create a flawless base. With out this blusher can become lost on the skin, amongst the natural pink in the skin and the variation in the skin tone. Do this by first applying a primer to clean and moisturised skin, this will ensure your base lasts and minimise pores. Next apply foundation with a brush, followed by concealer under the eyes and around the nose, as well as on blemishes. Next apply a powder to set your base. 2. Next you will need to contour your face, using a powder a few shades darker than your foundation. This works to add definition to the face. Sweep the powder across your forehead, under your chin, down either side of your nose and into the hollows of your cheeks. 3. Now it’s time to apply your blusher. You want to apply it to the apples of your cheeks only, to add a natural healthy glow. Using a blusher brush swirl the bristles of the brush into your blusher. Tap the brush on your wrist to remove the excess powder, the trick is to apply a subtle glow, rather than a block of colour. Sweep the brush over the apples of your cheeks, and blend a little with your contouring powder into the hollows of the cheeks, not working your way up to the ears, just blending a little where the apple of the cheek meets the hollow. The end result should be a natural looking flush, with flawless skin and subtle contouring, making for all natural flawless and healthy looking skin.